Any shape that is triangular in cross section. Lodge a bullet in the table. A large sandwich made of a long crusty roll split lengthwise and filled with meats and cheese (and tomato and onion and lettuce and condiments); different names are used in different sections of the United States. 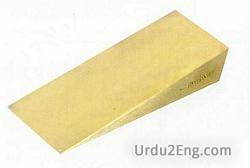 A block of wood used to prevent the sliding or rolling of a heavy object.